The promotion, dubbed College Tech Savings, began last week and runs through July 12th. It offers any student with a valid .EDU email address a handful of single use coupons, including one for $150 of MacBooks and iMacs, one for $50 off iPad Airs, and another for $50 off iPad minis with Retina display. The coupons exclude "Clearance" or "Marketplace" items. Update: Contrary to Best Buy's own fine print on the coupons, its online store is currently honoring $150 off the current sale price of MacBooks and iMacs with these coupons, rather than $150 off their regular price. The same goes for the $50 off iPad coupons. This effectively sweetens the pot and produces the lowest prices we've ever seen on MacBook Airs and iPad mini with Retina display. 21.5" iMac (2.7GHz/8GB/1TB) for $1,048.99. 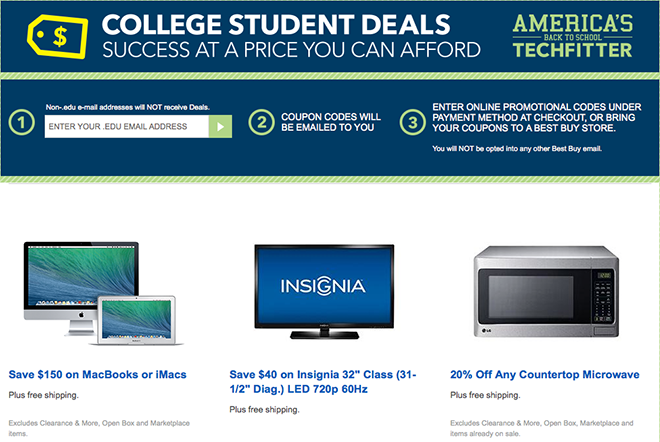 1) Follow this link to Best Buy's College Tech Page. 2) Enter your .EDU email address into the field and submit (Best Buy promises not to spam you). 3) You'll then receive an e-mail from Best Buy asking you to confirm your email address. Click the "Confirm Now" button in the email. 4) You'll then receive a second email from Best Buy titled "College Tech Savings." It will include several coupons, including the MacBook and iPad coupons. 5) You can then print those coupons and bring them to a Best Buy retail store, or return to Best Buy.com to shop online and then apply the "Promotional Code" listed alongside each coupon when you check out. Students should keep in mind that Best Buy does charge sales tax on all of its online orders. There are several other Apple Authorized Resellers listed in the Mac Price Guides and iPad Price Guides that do not charge sales tax in most states, which could yield lower net prices. For example: B&H only charges in NY, Adorama only in NY & NJ, and MacMall only in CA, CO, GA, IL, MN, NC, NY, TN, & WI. For those who don't have a .EDU email, Best Buy and B&H have this week similarly cut prices on Apple's retail configurations across the MacBook Air and iMac families by $100-$150. For all other configurations of MacBook Airs and MacBook Pros, MacMall currently offers the lowest prices anywhere when using the links in the Price Guides (relevant segments below) and then applying coupon code APPLEINSIDER01 for an additional 3% discount. Best Buy has also discounted all iPad minis with Retina display by $49 this week.